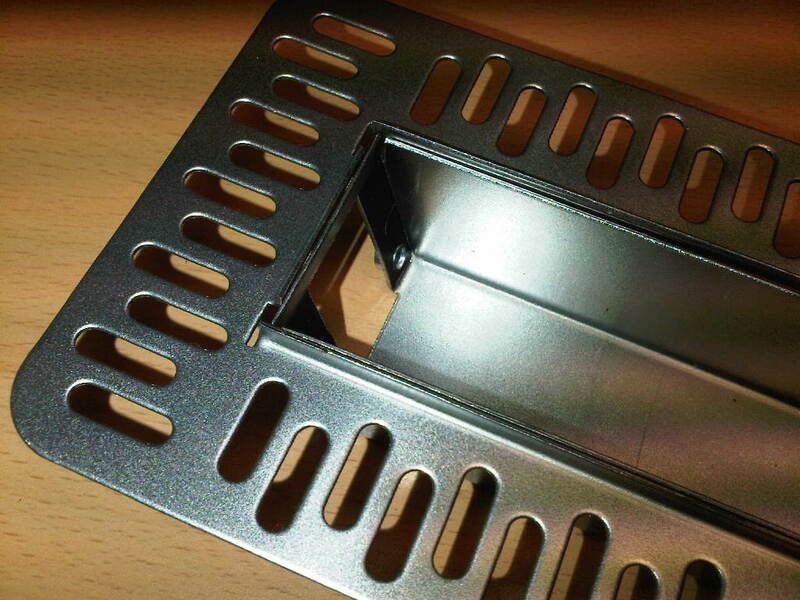 If you can design an engineering component from sheet metal and it can be manufactured in one continual piece this is nearly always the best approach for the most efficient method of production and therefore the cheapest component. 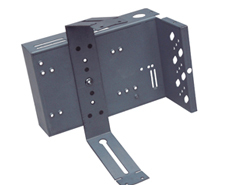 However, you may have to design a sheet metal fabricated component that has two or more gauges of sheet metal in its design, shapes that would be materially inefficient to be CNC punched as one part from a standard sizes sheet of metal or just impossible to be manufactured as one part from sheet metal. Spot welding techniques enable you to bring these parts of sheet metal together into one fabrication assembly. You have to be aware that a physical witness of the spot welding process may be seen and a heat affected zone (H.A.Z.) which can be visible as a small burn mark on the surface of the sheet metal. The witness can also be seen as a small indent in the surface of the sheet metal fabrication where the sheet metal has melted and fused together under the pressure of the copper spot welding tips. These indents may be left untouched on any internal sheet metal fabrications or components that do not need a cosmetic surface. How does the process of spot welding sheet metal fabrications work? The process of spot welding sheet metal fabrications is quite simple it is basically harnessing the heat generated by the resistance to electrical current flow at the interface/joint of two separate pieces of sheet metal. At V&F Sheet Metal we can spot weld mild steel, Zintec, galvanised steel and stainless steel in gauges from 0.7mm to 3mm thick. You can see from the photographs and picture that two copper electrodes are used to concentrate the flow of electrical current through the sheets of metal and clamp the parts in place whilst the spot weld is formed. The actual individual spot weld takes only a fraction of a section to be fused. Control is needed to regulate the quality of the spot weld between the 2 sheets of metal as the variables which affect the spot weld can be material gauge, surface coating, cleanliness and electrode tip shape. The smaller the copper electrode tip the more reliable the spot weld will be but the spot weld will be more obvious on the surface of your sheet metal components as an indent which may be important to you on cosmetic parts. The larger the copper electrode tip then the cleaner the spot weld will be on your sheet metal fabrication but the energy is dissipated over a larger area and the spot weld will tend to be weaker. This weakness can be offset by applying more spot welds to increase the joint strength at the interface of the sheet metal fabrication. Here at V and F Sheet Metal in Fareham, Hampshire we have 4 spot welding machines with the largest capacity being 30KVA. This range of spot welding machines enables us to be flexible to meet your needs by working on spot welding several jobs at a same time or setting all four spot welding machines to fabricate the same sheet metal parts when larger orders are placed or very short lead times are required to meet a tight production deadline. If more strength is required from the spot welded joints, a joint that can be cleaned up and made invisible after finishing or a water tight joint then seam welding will be the solution rather than spot welding. 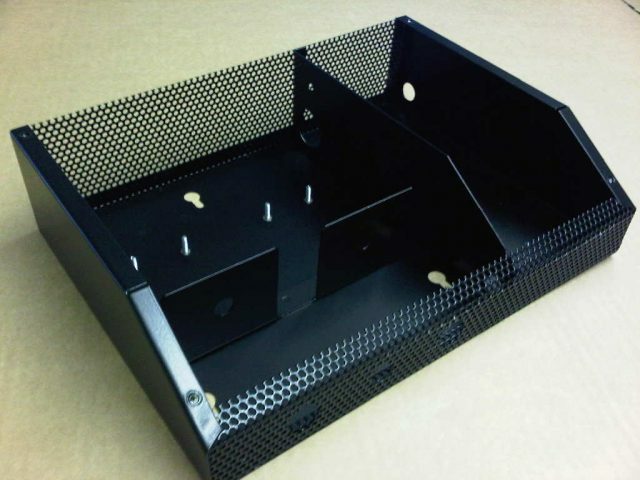 Take a look at our welding webpage for more information on the welding services we can offer you and sheet metal welding fabrication examples. Spot welding process with 2 sheets of metal being joined together. The resistance to the current flow between the 2 electrodes quickly heats put to a point where the metal melts and the force of the spot welding arms on the tips presses the metal together forming a small weld point. 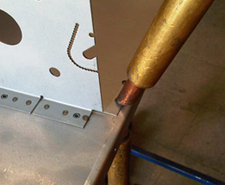 Spot weld tips – copper tips in brass holders during the fabrication process. Spot welding mild steel, zintec, galvanised steel and stainless steel is possible with standard spot welding equipment. Spot welded sheet metal fabricated 0.9mm zintec chassis with 1.5mm zintec legs. 6 spot welds have been used to fix the legs in place. 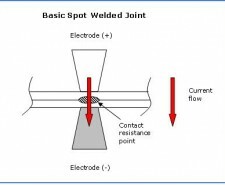 Multiple spot welds are used to counter the chance of a failed spot. Spot welded sheet metal work - lighting enclosure. 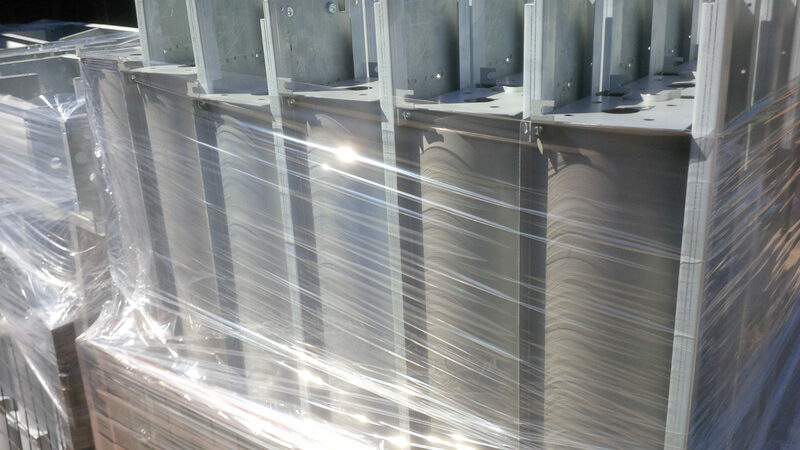 Solid mild steel has been spot welded to perforated mild steel panels with no problem. The whole assembly has been powder coated black and produces a pleasing finish. 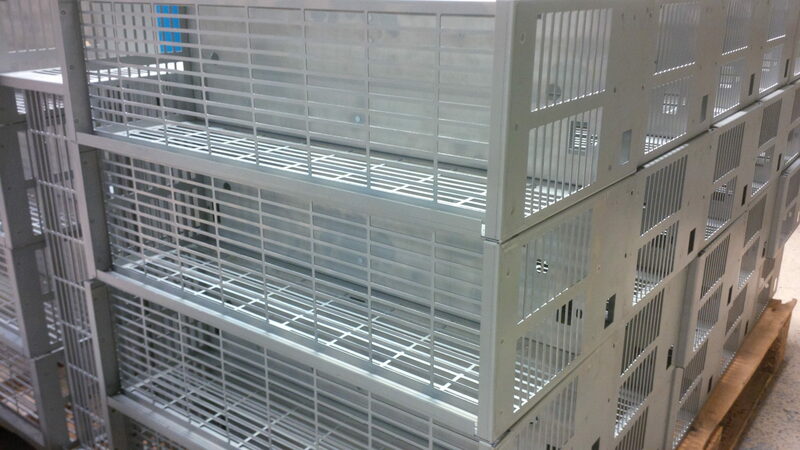 Sheet metal fabrications - spot welded Zintec fan enclosures assembled from several components. 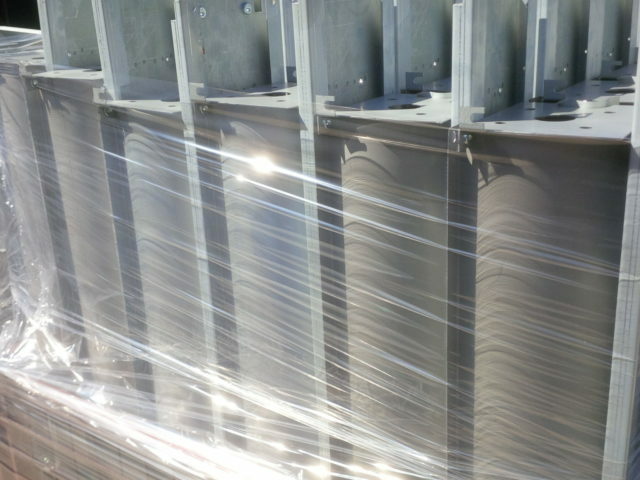 Spot welded zintec assemblies packed and ready for shipping. Manufactured from 0.7mm, 0.9mm 1.2mm and 1.5mm zintec components. 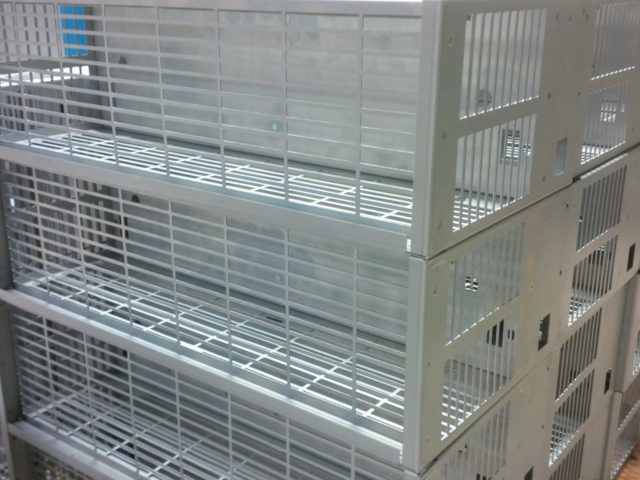 Zintec spot welded housings waiting to be powder coated. 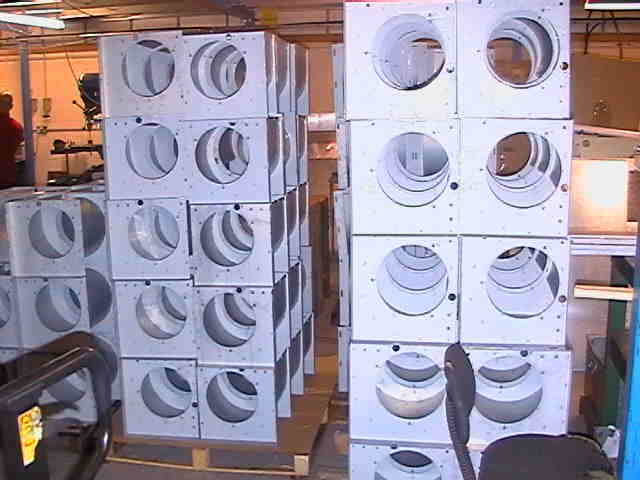 These housings have been CNC punched and CNC bent before being spot welded together. Spot welded mild steel plaster in wall light housing. The final assembly will be powder coated before shipping to the customer.